A bar stool that will make any stainless steel aficionado smile, the Dazzer Bar Stool from Zuo Modern adds a touch of glamour to any modern or retro setting's d�cor. 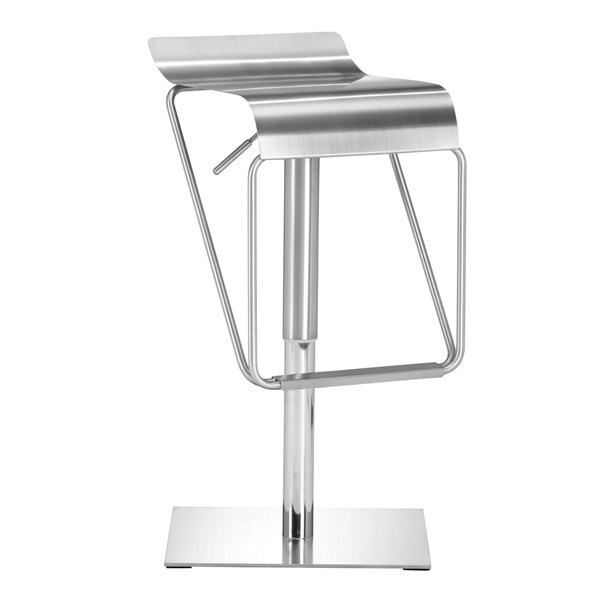 This unique bar stool boasts 100 percent stainless steel construction, ensuring outstanding quality. Furthermore, the bar stool includes a curved seat for amazing comfort, along with an adjustable frame that makes it easy for kids and adults to relax in this seat. Experience the beauty and elegance of a superb bar stool day after day thanks to the Dazzer Bar Stool. Stainless steel construction gives the bar stool a dazzling look and feel. 100 percent adjustable, making the bar stool a great seat for both kids and adults. Curved seat delivers amazing comfort. Strong, sturdy base offers maximum support at all times. Unique design ensures the bar stool makes a bold statement in any contemporary kitchen or dining room.